The Samford University Alumni Association is accepting nominations for 2018 Alumnus of the Year, Outstanding Young Alumnus of the Year and Humanitarian of the Year. These are among the university's highest honors. The nomination cycle closes on Friday, March 16. The recipients will be honored during Homecoming weekend, Nov. 2-4. Nominees for Alumnus of the Year should be distinguished in their professional careers, community and church involvement, and in their ongoing service to and financial relationship with Samford. Recognition can be for lifetime achievement or for a significant achievement during the previous year. To be eligible, graduates must have completed at least one Samford degree at least 10 years prior to selection (2008 or earlier). Nominees for Outstanding Young Alumnus award also should be distinguished in their professional careers, community and church involvement, and in their ongoing support of Samford. To be eligible, graduates must have completed at least one Samford degree within the last 10 years (2008 or later). Nominees for the Humanitarian of the Year award must be graduates of true distinction, wide respect and acknowledged leadership. 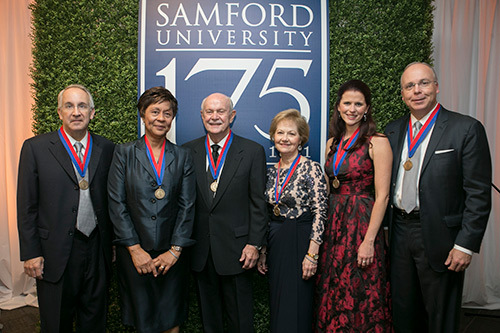 Nominees are recognized for having given selflessly and working tirelessly to better the lives of others and society at large by staying true to the Samford University mission. To be eligible, graduates must have completed at least one Samford degree. “These are the most prestigious awards than an alumnus would receive from the alumni association,” Casey Ramey, director of alumni programs said. Submissions can be made at the following web pages. In addition to the online nomination form, forms can also be mailed to the Office of Alumni Programs and Annual Giving, 800 Lakeshore Drive, Birmingham, AL 35229.